Drinks after work at Club Lago tends to make us super hungry, if you can believe that! Even though Guido let us sample the new meatball sandwich he's working on, for the second time- we still needed more food. I blame our hunger it on the walk home in zero degree temperatures.... and the liquor. The absolute quickest thing to make in a situation like this is a quick pasta dish; in the time it takes for the pasta to cook- you'll have the rest of your ingredients chopped and ready to go. 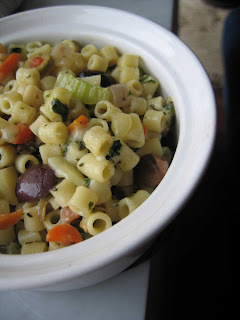 This pasta dish is really another variation of my mock macaroni and cheese dishes. So easy to change up the type of pasta, the cheese and the veggies being used. Using the pasta water helps give it a cheap 'sauce-effect.' You'll love the bites that have a warm crumble of goat cheese, mmmh good. And what's even better, this particular recipe works great as a cold salad as well. 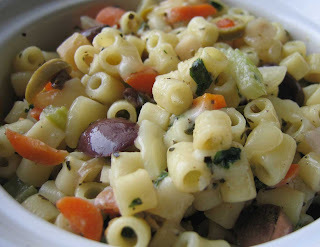 The ditalini pasta is a tiny tubular pasta that works great in soups, and I like it on cold pasta salads as well. And it's real tasty after a couple of glasses of vino! Now that you know how easy and cheap it is to throw a meal together, you can afford to go out and support your local clubs with a drink or two. Keeping the neighborhood joints like Club Lago alive- that is the Fat and Happy way! Serve immediately with a hunk of bread. *if you want to make this a cold/room temperature dish, simply cool the pasta after draining and the toss with all ingredients, skip the pasta water but do add more olive oil with the sauteed veggies.